It is a very common scenario historically and in contemporary chiropractic offices where patients come to get treated for one body part and another body part feels better. To be more specific a patient will come in with neck pain as their primary complaint and upon treating that neck problem with chiropractic spinal adjustment their low back feels better. Through the years many patients have considered this a “miracle” and the doctor of chiropractic simply accepted this clinical finding as an everyday experience with no concrete answers. Thanks to contemporary research, there are answers. Coronado et al. (2012) reported that, “Reductions in pain sensitivity, or hypoalgesia, following SMT [spinal manipulative therapy or the chiropractic adjustment] may be indicative of a mechanism related to the modulation of afferent input or central nervous system processing of pain” (p. 752). 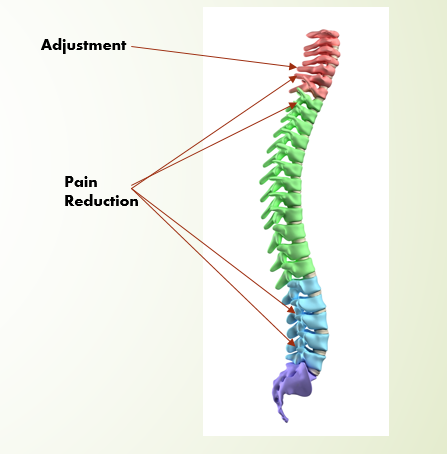 This indicates that the chiropractic spinal adjustment reduces pain by effecting the thalamus and descending central pain pathways and effects multiple areas of the body, not just the area directly treated. One of the main questions asked by Coronado et al. (2012) “…was whether SMT (chiropractic adjustments) elicits a general response on pain sensitivity or whether the response is specific to the area where SMT is applied. For example, changes in pain sensitivity over the cervical facets following a cervical spine SMT would indicate a local and specific effect while changes in pain sensitivity in the lumbar facets following a cervical spine SMT would suggest a general effect. We observed a favorable change for increased PPT [pressure pain threshold] when measured at remote anatomical sites and a similar, but non-significant change at local anatomical sites. These findings lend support to a possible general effect of SMT beyond the effect expected at the local region of SMT application (p. 762). We are now starting to get answers and reasons for what was once considered “miracles.” The research has verified that the chiropractic adjustment does not deliver miracles, it only helps the body work better and we now know why. Coronado, R. A., Gay, C. W., Bialosky, J. E., Carnaby, G. D., Bishop, M. D., & George, S. Z. For decades chiropractors and their patients have been experiencing many positive outcomes that have gone well beyond the pain treatment they originally sought. This author has been practicing for 34 years and has witnessed what many thought were miracles, but the seasoned chiropractor simply called it an everyday occurrence, albeit lacking in an explanation that was verified through research and published in a universally accepted forum, the scientific literature. Notwithstanding, we practitioners and our patients have persevered for over 115 years having to rely simply in results. In 2014, Gay and fellow researchers concluded “…pain-free volunteers processed thermal stimuli applied to the hand before and after thoracic (mid-back) spinal manipulation (chiropractic spinal adjustment)). What they found was that after thoracic manipulation, several brain regions demonstrated a reduction in peak BOLD [blood-oxygen-level–dependent] activity. Those regions included the cingulate, insular, motor, amygdala and somatosensory cortices, and the PAG [periaqueductal gray regions]” (p. 615). In other words, thoracic chiropractic adjustments produced direct and measureable effects on the central nervous system across multiple regions, which is responsible for the processing of emotion (cingulate cortex, aka limbic cortex) and the insular cortex, which also responsible for regulating emotion as well has homeostasis. The motor cortex is involved in the planning and execution of voluntary movements, the amygdala’s primary function is memory and decision making (also part of the limbic system), the somatosensory cortex is involved in processing the sense of touch (remember the homunculus) and, finally, the periaqueductal gray is responsible for descending pain modulation (the brain regulating the processing of painful stimuli). We are now starting to get answers and reasons for the results that was once considered “miracles.” The research has verified that the chiropractic adjustment does not deliver miracles, it only helps the body work better and we now know why.